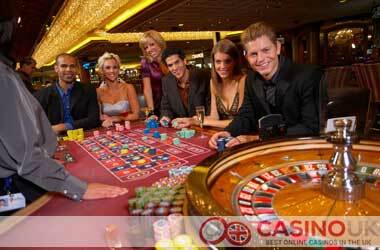 Roulette is another gambling game that is popular not just at land-based casinos but also at online casinos. The game’s popularity and the ambience associated with it has led to it being recreated at online casinos in its live-dealer avatar as well, with a real-life croupier spinning the wheel and accepting your bets for a spin. How Real money Roulette Started? Roulette is considered one of the oldest and most recognisable casino games in the world still being played to this very day. In this article, we will uncover how this casino game first came into existence and how it spread and evolved across the world throughout its colourful 400-year history. We will look at the differences that occurred since its invention, up to the modern day online versions we all love and enjoy. We will also take a stroll through the different variations of the game, look at a few roulette strategies, rules, and payouts, and conclude the article with a few fun facts and frequently asked questions surrounding this iconic casino game known as roulette. Deriving its name from the French word that means ‘little wheel’, this game has been played in its current form since as early as 1796. There are other theories about the invention of the game as well, including one that attributes it to a French monk and another attributing it specifically to Dominican monks in France taking as the basis a game that existed in Tibet already. The origin of Roulette is not 100% clear, but it is believed that it evolved from ‘Rota Fortunae‘, or the ‘Wheel of Fortune‘. This concept derives from ancient and medieval philosophy with the goddess of fate turning the wheel as the king rises and falls, symbolising happiness and unhappiness that makes it a great metaphor for gambling. Other influences are attributed to the Italian board game known as Biribi, and the English E.O (even/odd) games. 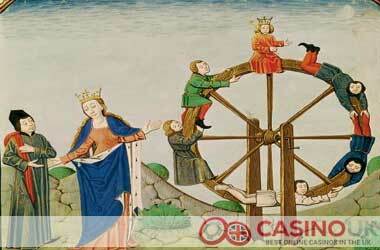 There’s also other games linked to the invention of roulette, but unfortunately not of them are completely accurate. Roulette is widely believed to have been invented by Blaise Pascal, a French physicist who was a prominent figure in the world of mathematics and science, breaking new ground in his research. Pascal introduced the mathematical theory of probability through his work, and there was no study of probabilities linked to gambling prior to his research. He wrote a renowned thesis entitled “L’Histoire de la Roulette” while researching cycloids. The title was given as cycloids were involved in the rolling of wheels. The roulette wheel, in its primitive form, was believed to be a bi-product in his quest to invent the perpetual motion machine. Among these numerous theories regarding the origins of roulette, it appears that the game was invented during the 17th century in Italy. In fact, until the early 1900’s, encyclopedias called the game either Big Roulette or Italian Roulette consisting of 38 numbers. A smaller version of the game was referred to as German Roulette or Small Roulette as it was played with 18 numbers. During the 18th century, the game spread across France, becoming extremely popular and famous in casinos. It featured a slightly different layout when compared to the modern game, and in 1790 a zero was added to the game in red and a double zero in black. Despite the colours, these were known as house pockets. So, if you placed a bet on black or red, and the ball landed on the double zero or zero, you would lose your bet. To avoid possible confusion, the zero and double zero were coloured green in the 1800’s. King Louis XV attempted to ban the game of roulette when it was introduced in France, and in 1806 Napoleon Bonaparte only allowed the game of roulette to be played in the casinos of Palais Royale. In 1837, roulette was outlawed altogether when Louis Phillipe managed to close all casinos situated in France. 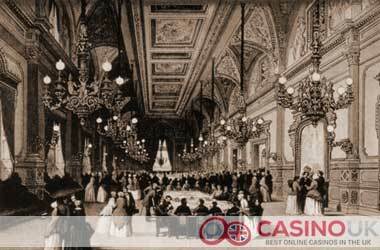 This introduced the golden era of German casinos in Wiesbaden, Bad Homburg, and Baden-Baden. During this period, Russian author, Dostoyevsky, wrote his famous novel “The Gambler” that was based on his experiences in the casino situated in Bad Homburg. 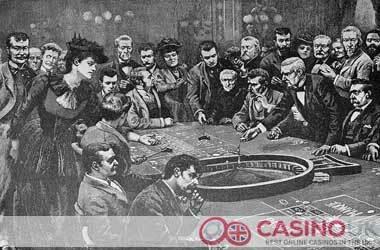 In 1843, to gain an advantage over the competition, brothers Louis and François Blanc, of the Bad Homburg casino decided to remove the double zero from the roulette wheel and soon thereafter, the single zero variant of roulette was found in most casinos across Europe. During the 1860’s, casinos were outlawed throughout Germany and was only re-opened in 1933 by the Nazis. The gambling ban in France and Germany meant that across Europe, casinos were only operating and thriving in Monte Carlo. The Blanc brothers decided to move their operation to Monte Carlo, establishing an elite and prestigious gambling mecca. The single zero variant of roulette became extremely popular in Monte Carlo and was exported throughout the world in the years to follow. Not only did roulette flourish in Europe during the 18th century, but it also had a massive impact in America around the same time. The earliest version of American roulette only featured 28 numbers along with a zero, double zero, and a house pocket known as the Eagle. The eagle represented the American symbol for liberty and added extra house edge for casinos. If the ball landed on the zero, double zero, or the eagle symbol, all bets would have been lost. This unique version of the roulette wheel soon paved the way to the European version of the game featuring numbers ranging from 1 to 36 and only the zeros provided the house edge. The game of roulette first appeared in New Orleans, working its way up the Mississippi on paddle steamers and later spreading westwards into the frontiers. Published regulations for Quebec, or ‘New France’ as it was known then, also had several references to the game of roulette in 1758 where roulette was banned along with other gambling games. The style of play in Europe also differed to that in America. The game evolved with style within the casinos of Monte Carlo, providing a leisurely, high-end playing experience. Whereas in America, the game was played in gambling dens across the new territories. Owing to the cheating practices by both operator and player, the roulette wheel was placed atop a makeshift table that prevented any devices from being hidden under the table that could manipulate the end results. The layout of American roulette was also altered to offer simplified betting choices, making the pace of the game much faster. The trend in Europe, however, was for the wheel to simply include a single zero. The double zero, providing a far greater house edge, remained dominant in the United States. This remains the biggest difference between the modern versions of American and European roulette. The American version of the game is also dominant in South America, the Caribbean, and Canada. Whereas the European version of the game is predominant everywhere else in the world. Casinos were not widely spread during the early part of the 20th century. You could only play at two noteworthy places, including Las Vegas with the double zero American roulette version and Monte Carlo with the single zero European roulette version. 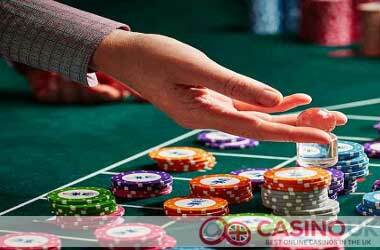 During the 1970’s casinos increased in popularity and started to flourish across the globe. However, the real boom started with the spread of the internet. As more and more homes gained access to the internet, a new generation of casinos were born where players could gamble online, and in 1996, the first online casino opened its virtual doors. The evolution of online casinos brought several unique changes to the way players enjoy the game of roulette. Players can enjoy the game around the clock on both European and American versions of the game. Furthermore, the advancement of computer technology introduced the development of innovative and new versions of roulette. With the removal of physical limitations, there are now a plethora of variations available online including Multi Wheel Roulette, Mini Roulette, Pinball Roulette, and Multiball Roulette to give you a few examples. The benefits coupled with the evolution of online casinos were tremendous, but the atmosphere of a real casino was still one factor that remained missing. There is no denying that playing online while utilizing online casino software is convenient and simple, but it’s far less exciting when compared to playing in an actual land-based casino. To successfully address the issue, online casinos started streaming live games from real casinos. VueTec was the first company to offer real games to online casinos. These initial live games utilised a webcam, situated in land-based casinos, to stream each game. Players would place a bet at an online casino, and a real roulette table would determine the winning number instead of an electronic random number generator. The first attempt to offer live casino games to online casinos were significantly weak. Casino operators didn’t want to disturb the players at their land-based venues, so webcams were mounted on the ceiling, or high above the tables. This was extremely problematic for those playing online as players were unable to get a clear view of the table due to the camera being too far away from the table. Land-based players would also get in the way of the action, and online players couldn’t interact with the dealer at the table either. As for the video streaming quality, there was loads of room for improvement. Another factor that impacted the overall gaming experience was the slow internet connection at the time that didn’t allow for high-quality streaming. The first dedicated live casino studio was only introduced in 2006 by Evolution Gaming. They started the move and introduced custom-made studios offering casino games with real dealers to online operators. The advantages for creating an exclusive studio aimed towards live streaming were significant. Cameras were placed in better positions, providing an optimal view of the game to online players and numerous cameras could be utilised, offering several different views of the game, including close-up shots of the action. This approach eliminated land-based players from interfering, making the croupier and game clearly visible. Furthermore, interaction with the dealer was made available for the first time, improving the atmosphere and bringing it closer to a real casino experience. Different variants of live roulette were later introduced with games such as London Roulette and Sports Roulette being offered by several providers. All variants of the roulette game were based on the European/French game featuring a single zero. American Roulette is not offered by any live casino. Immersive Roulette is the latest craze in live games as it provides true HD quality along with several camera angles and slow-motion replays. This cutting edge and innovative game has been a massive hit where it claimed the Game of the Year award at the EGR Awards in 2013. Roulette table: This is also called the layout. In an actual land-based casino this is a table covered with a green baize cloth. The number of zeros on the layout depend on the kind of roulette you are playing. There are also the numbers 1 to 36. Roulette wheel: This is a wheel inside a bowl-shaped space that has pockets numbered from 1 to 36 and also a 0 (or a double zero, depending on the version you are playing). The croupier spins the wheel clockwise at a land-based casino. At an online casino, the spin is achieved by hitting the spin button. Ball: This is a single silver colored ball that is thrown on to the wheel as it is spinning. The ball rolls counter to the direction the wheel is spinning in. It lands on one of the pockets of the wheel and the player wins or loses depending on the bets he has placed on the probability of the ball landing on a certain number. Chips: There are colored chips you can buy from the cashier to fund your roulette game. You place the chips on a specific number/range of numbers or a particular color – red or black before the croupier spins the wheel. How to Play Online Roulette for Real Money? Playing online roulette is fairly simple and easy. Follow the steps listed below and you are on your way. 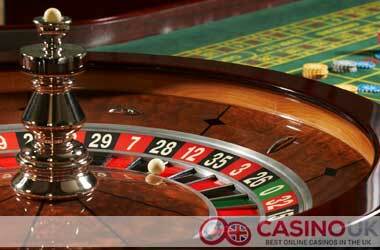 Sign up with a casino that offers different variants of online roulette so you have a range of games to choose from. Next, ensure you have funds in your casino account. Get to know the different bets. Check out the payouts for the different bets. Once you are familiar with the game and the table choose and then place your bets. Ensure you do not place any more bets after the call for bets has expired. Once the wheel stops spinning and the ball lands on a pocket, check if you have won or lost. If you have won, you have the option of collecting your winnings or leaving them on the table for the next round. You can replicate the same bets across multiple rounds or change the bets after a round. This is the classical form of roulette. It has the numbers 1 to 36 marked on the table and also inside the wheel on the pockets. This is the most preferred form of roulette because the presence of just a single zero. The numbers 1 to 36 are marked in red while the single zero is in green. The single zero gives this game a low house edge of 2.70%. This is another popular variant of roulette. It uses a standard European wheel with the numbers 1 to 36 and a single 0. 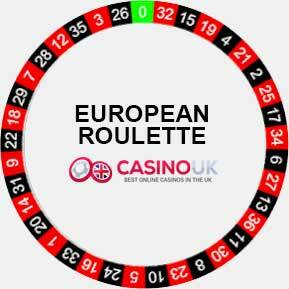 The table layout is, however, different from European roulette. The numbers on the pockets are in red and black, while the zero pocket is green. The numbers on the tables are all in white. The presence of a unique bet reduces the house edge considerably to 1.35%, making this the roulette game with the lowest house edge. That is why you do not find this game too often at online casinos. The numbers are presented on the table through the center of the grid; this makes the layout quite different from what you see in French roulette. The outside bets in this game are placed along both sides of the table, unlike in the other variants. 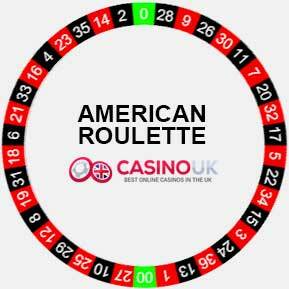 American roulette is a popular variant of roulette that is seen quite frequently at online casinos catering to players from the UK. The fundamental difference between this and other variants of roulette are in the number of zeros. Unlike European and French roulette that has the numbers 1 to 36 and a single 0 on the table and also marking the pockets of the wheel, American roulette has 38 pockets in all – the numbers 1 to 36, a single zero (0), and also a double-zero (00). This increases the house edge to 5.26%, making it the online roulette with the highest house edge. 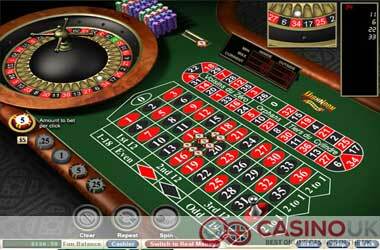 The high house edge is one major why this version of roulette features in almost every online casino. The layout of the table and wheel in American roulette is almost identical to that of European roulette except for the addition of another slot or pocket for the 00. Racetrack roulette: This is another newer variant of roulette that has caught the fancy of the players. 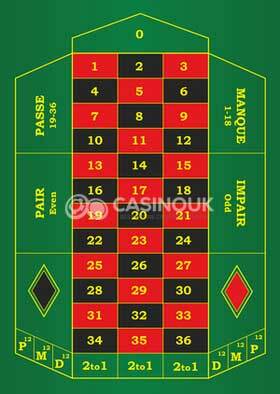 Depending on the casino you are at, you could find this version in both European and French roulette table format. It consists of an additional betting area. This additional area is above the main playing grid. Mini roulette: Mini roulette is another roulette variant that is not quite as popular as the others. The layouts are the same as the original European, French, or American roulette games. 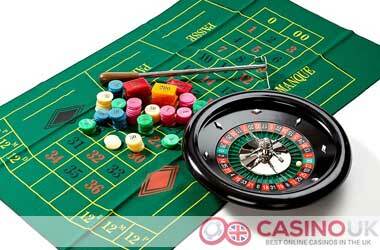 There are different types of bets you can place when you are playing roulette at your favorite UK casino. We list the main types for you below, along with their bet variants depending on the parameters in play. Straight or Single: This is a bet on a single number, as the name suggests. This is known as a single number bet or wager. It will pay 35 to 1, and you will need to place a chip inside the number of your choice to make this bet. Split: This is a bet on two numbers that are adjacent either vertically or horizontally. This bet covers two numbers and will pay 17 to 1. You will need to place a chip on the line between the two numbers of your choice to make this bet. Street: This is a bet on three consecutive numbers arranged in a straight horizontal line. This bet covers three numbers on a single horizontal line and will pay 11 to 1. 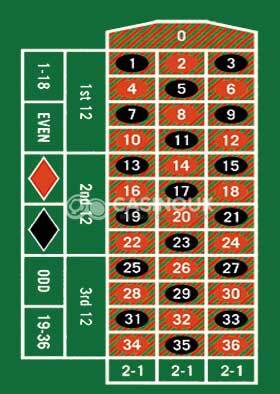 You will need to place your chip on the end of the line, either on the right or the left depending on the roulette table layout, to place this bet. This type of inside bet is also referred to as a line bet. Corner or Square: This is a bet on the numbers that meet at a corner. This bet covers four numbers and will pay 8 to 1. You will need to place your chip in the middle of your four chosen numbers. This type of inside bet is also referred to as a Square or Quad bet. 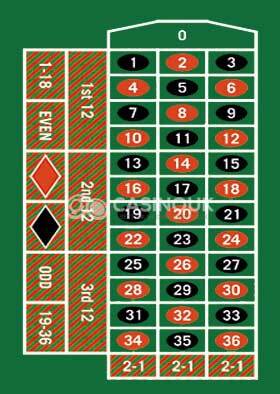 Six Lane or Double Street: This bet is placed on six numbers that are arranged in two lines horizontally. This bet covers six numbers and pays 5 to 1. You will need to place your chip in between Street bets, basically covering two street bets together. This type of inside bet is also referred to as a Six Line bet. Trio: This bet is on three numbers, with at least one of them being zero. The zero could be a single zero (0) or a double zero (00). You will need to place your chip on the intersecting point between 2, 1, and 0 to make this bet. This bet can only be placed on the European version of Roulette and is also referred to as a Trio bet paying 11 to 1. First Four or Basket: This bet is available in European and French roulette only and is on the numbers 0, 1, 2, and 3. You will need to place your chip on 3, 2, 1, 00, and 0 to make this bet and pays 6 to 1. This bet can only be placed on the American version of Roulette and is considered the worst bet in Roulette. Top Line: This bet is available in American roulette only and involves betting on 0, 00, 1, 2, and 3. You will need to place your chip either on the corner of 3 and 00 or 1 and 0 to make this bet paying 6 to 1. This bet can only be placed on the American version of Roulette. This bet type is named from the fact that playing chips are placed inside the grid found on the roulette table, also referred to as the number grid. Should the roulette table have a minimum bet of £10, you will be able to place £10 on one number or 5 bets of £2 each on different numbers – the choice will ultimately be yours. Outside bets are the other most common type of bet in roulette. These bets come with good odds but low payouts. A player loses on these bets if the ball lands on a 0. However, in the UK the rule is slightly different for outside bets: a player loses only half his wager if the ball lands on 0 or 00 and he has placed a low-high, red-black or even-odd bet. 1 to 18: This is a bet on the ball landing on any number from 1 to 18. Red or Black: This is a bet on the ball landing on the pocket color type the player chose. Even or Odd: This is a bet on the ball landing on the type of number the player has chosen. Column Bet: This is a bet on the ball landing on the chosen vertical column till 34. Snake Bet: This is a special bet in roulette that gets its name from the pattern formed because of the numbers it covers. It covers the numbers 1, 5, 9, 12, 14, 16, 19, 23, 27, 30, 32, and 34. This bet is not available at all online casinos. 1 to 18: You will need to place your chip on the first eighteen numbers to make this bet and will pay 1 to 1. This is illustrated by a square on the table showing ‘1 to 18’. 19 to 36: You will need to place your chip on the on the last eighteen numbers to make this bet and will pay 1 to 1. This is illustrated by a square on the table showing ‘19 to 36’. Black or Red: You will need to place your chip on either the black or red squares to make this bet and will pay 1 to 1. This is also considered one of the most popular bets on the roulette table. Odd or Even: You will need to place your chip on either the ‘Odd’ or ‘Even’ squares to make this bet and will pay 1 to 1. Should the ball land on an even number, and you placed a bet on the even square, you will win. The same can be said with the odd square and odds numbers. Dozen Bet: You will need to place your chip on either the first 12, second 12, or third 12 squares to make this bet and will pay 2 to 1. Column Bet: You will need to place your chip on the column squares consisting of 12 numbers and will pay 2 to 1. There are three boxes located at the foot end of the numbers illustrated by ‘2 to 1’ squares. Unlike blackjack being a highly skilled game, there’s not much you can do in roulette to change the odds. The biggest advantage you can give yourself is by playing French or European style roulette. The European version of roulette only has a house edge of 2.7%, whereas the American version increases the house edge up to 5.6% with the double zero square added to the game. There is a wide variety of bets in roulette, but most of them provide very similar payouts. The best advice I can give you is to play it simply by either betting on odd/even, red/black, or 50/50. The best methods of cutting the house edge is by playing French style roulette. The La Partage rule is extremely useful, especially when playing outside bets. If the ball lands on 0, La Partage will give you half of your stake back. French roulette tables also feature an En Prison rule, following the La Partage rule, it allows you to leave your bet on the table for another spin. If you have both En Prison and La Partage, the house edge decreases from 2.7% to a mere 1.35%. This is the lowest house edge you’ll find in roulette. The Martingale system, where you double your bet after every loss until you win, is considered the most popular system in roulette. However, it’s better to avoid this system as it only works in the long-term with the ability to circumvent the roulette table limits, plus have unlimited funds. The best way to play is by using a flat betting system where you bet the same amount over and over. This way, the house edge will be your only foe. You will never find yourself sweating when using the flat betting system and you will never have to risk your entire bankroll on one spin. If you decide to play online, it would be more beneficial to play Live Dealer games instead of random number generator versions. Live Dealer versions are far more reliable and harder to cheat on. You will also be able to detect inconsistencies or problems affecting the table, as it utilises genuine equipment. Money management is the biggest factor to minimising your losses. Ensure you never under too much pressure by only betting 5% of your bankroll on one spin. The Martingale System: A simple betting system that requires you to double your wager with each loss till you score a win, thereby recovering your losses. Once you score a win you revert to your original wager amount. The d’Alembert System: Created by Jean Le Rond d’Alembert, this system requires you to reduce or increase the size of your bet depending on the outcome of your last hand. Reduce the bet if you won and increase it if you lost. The Fibonacci System: This system is based on the Fibonacci number series of 1, 1, 2, 3, 5, 8, 13, 21, 34, 55, 89, and more. The name roulette derives from French that means ‘little wheel.’ It is also referred to as the King of Casino Games due to its strong connection with Monte Carlo. ‘The Devil’s Game’ is another name for roulette because all the numbers on a roulette table add up to 666. American roulette tables offer a ‘Five’ bet, covering the two zero squares and the 1 – 3 squares. This increases the house edge by 7.89%, making it the worst bet in roulette. 17 is the most common number played on a roulette wheel. This is due to its central location on the table layout, and it was the number James Bond played in his movies. The record for the same number landing consecutively took place in Las Vegas at the Rio Casino where 19 hit seven times in a row. The chances of that occurring are 1 in 3 billion. There is no need to travel, saving you time and money. You can play from wherever you want by simply going online and logging in, and you can make smaller bets. Yes! Most online casinos will allow you to play for free and will only require you to register with the casino that only takes a few minutes. Which casinos offer the highest and lowest table limits? Almost all casinos offer a minimum table limit of £1.00, whereas some of the best online casinos offer a maximum bet limit of £500.00. Can I make a living by only playing roulette? Of course not, you won’t be able to beat the game in the long-run, and there is no way to shift the game odds in your favour. How old do I need to be to play online roulette? Most casinos will allow you to play when you turn 18 or in some cases 21. Simply read the terms and conditions of your desired casino to find out exactly. What are the lowest roulette limits in Vegas? It’s possible to locate a $3 roulette table, but you will need to travel off the strip to find the lowest table limit. What type of betting systems do players use for roulette? There are quite a few betting systems you can look at, including Wells Pendulum, Six Pence, Pivot, Oscar’s Grind, Martingale, Grand Martingale, Anti-Martingale, Law of the Third, Labouchere Cancellation, Guetting, Green Black Attack, Finonacci, Cuban, and The Colum King. Do I need to pay taxes on the winnings I make from roulette? Depending on the game, if you win more than £600-£1,500, the rule of thumb is that you’ll need to report it as additional income. Simply talk to an accountant to determine if its required to pay taxes, and how much you’ll need to set aside.